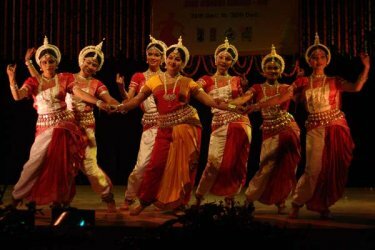 February 17, 2010 The National Festival of Odissi Dance & Music 2009 took place from 26th - 30th December, at Rabindra Mandap, Bhubaneswar. The morning session of 29th December 2009 was inaugurated by Kumkum Mohanty. The first part of the session was devoted to a seminar on "Use of properties, stage sets, costumes according to the characters in Odissi classical dance drama presentation." The general consensus was that while stage props were acceptable as support for certain kinds of compositions, the actual dance performance must have priority at all times and the props used must not disturb, in any way, the actual dance. A stage prop could be used when the choreography demanded it, and only as an instrument to improve the communication between the performer and the audience. The prop must not assume a higher prominence than the dancer/s. The greatest asset for a choreographer would be to use the dancer's body in such a creative way that gestures and postures themselves convey an abundance of meaning and thus become very communicative props by themselves. Two papers were presented at the seminar, one by Dr. Ileana Citaristi and the other by dancer/choreographer Sharmila Biswas. While Citaristi's paper was a fund of information on the history of props used on the Oriya stage, down the years, Sharmila Biswas spoke about Guru Kelucharan Mohapatra's use of props derived from the dress or customs of a particular locale where the performance was taking place. 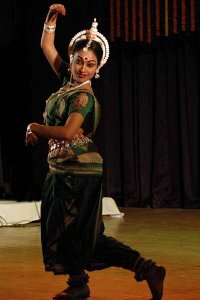 She gave examples of how her Guruji included, for a particular performance of "Bhanusingher Padabali," the familiar shawl used in Rabindric performances together with the normal Odissi costume in such an effective way that the shawl used as a prop conveyed a local flavour without impinging upon the formal Odissi dress. The discussion panel consisted of Guru Ratikant Mohapatra, Guru Sudhakar Sahoo, Aruna Mohanty, Guru Bichitrananda Swain, Guru Gajendra Panda, Guru Pitambara Biswal, Jyoti Srivastav and Khirod Patnaik. The first item in the dance section in the morning session was the "Nabadurga" performed by Baishakhi Ganguli from Kolkata. Although blessed with beautiful features and pleasing appearance, her dancing was rather stiff and this combined with the scanty use of stage space, reduced her performance into an ordinary one. She performed to recorded music. The item was choreographed by Guru Ratikant Mohapatra and the music was composed by Harihara Panda. The next item was "Shiva Panchaka" performed by Navnita Pal from USA. Since the item is on Lord Shiva, it demanded more vigour and power than the dancer could deliver. While it was a good performance, the dancer, however, could have paid more attention to the dominant mood of the subject-Shiva. The dance choreography was by Guru Gangadhar Pradhan and the music was composed by Pt. Balakrushna Das. Like in the previous instance, Mallika Bhandarkar also delivered a standard performance. But it was rendered lacklustre by the absence of ‘brightness' in the movements as well as the expressions. 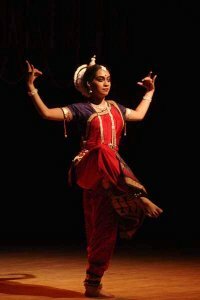 For an Odissi performance to be good, it is not enough for the dancing to be merely correct but must have a spark, which is possible with a combination of rigorous practice and enthusiasm on the part of the dancer. Both Mallika Bhandarkar and the previous dancer Navnita Pal have it in themselves to become much better performers. The item "Aaigiri Nandini" was choreographed by Jyoti Rout and the music was composed by Sarat Kumar Sahoo. The following item was "Durga" performed by Bishwajit Dash. 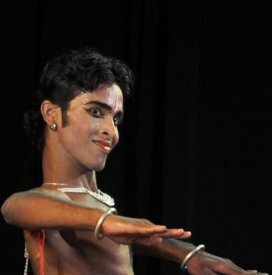 While extra care has to be taken by a male dancer when dancing a feminine subject, Bishwajit, by exerting more power and vigour, took away the "femininity" that the subject called for; another example where an extraordinary performance by a competent dancer failed to become one because the dancer neglected this vital element. I have seen his performances in the past and he is certainly capable of much more. The item's choreography was by Guru Kelucharan Mohapatra and the music was composed by Debashis Sarkar. 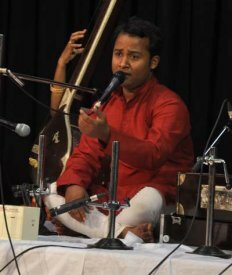 The first item of the evening session on 29th December 2009 was an excellent duet Mardala recital, made all the more appreciable because of the youth of the players Arup Das and Murlidhar Swain. It was a neat and flawless performance by both of them who showed that they could handle this difficult instrument very well. The future is bright for both of them. They played the Adi tala. The next item, a set of two pieces, was performed by Nazia Alam, who in spite of being a good singer gave an unexpectedly indifferent performance. Her voice strained in the upper registers and the resultant shrillness did disturb what otherwise could have been a good performance. The songs sung were "Kunje murali bajuchhi" and "Naja Jamuna." The concluding item of the music section was a duet by Pradip Kumar Das and Bishnu Priya Priyadarshini. They sang two songs - "Kaha chitta taha chahin nabaliba" (Raga Kirwani) and "Kahibu jai Shyama bandhunku" (Raga Bakulabharana) and the performance left much to be desired. While Pradip needs to improve the 'gayaki' which would improve the flatness of his singing, Bishnu Priya's performance was below par and she needs substantial improvement in almost all aspects of her singing. This was not a National Festival level performance. The traditional tunes of these songs were adapted by Guru Ramahari Das and the accompanists were Subhashis Barala on harmonium and Niranjana Patra on mardala. As always, Niranjana Patra played exceptionally well and his clever accompaniment to the singing saved the item from totally falling flat. The opening item for the evening session were three dance pieces which were presented very well by Namrata Gupta, and showed excellent training and practice. There was however a noticeable flaw in the 'Chauka' which needs to be corrected to make an Odissi performance flawless. In Namrata's case, in the 'Chauka' the knee bend and the toe need to be in a perfect vertical line. In this instance the knee bend was jutting forward. Otherwise an excellent performance. While the first item "Bhumi Mangalam" was choreographed by Daksha Mashruwala with music by Manoj Desai, the subsequent two items "Kirwani Pallavi" and "Tolagi gopa danda" were choreographed by Guru Kelucharan Mohapatra with music by Pt. Bhubaneswar Mishra. In spite of dancing three pieces, the dancer stayed within the time allotted, and this is a good thing. The following item was a good presentation of "Barsha Barnali" by Shibani Pattnaik and the excellence of the performance was made even more commendable by the fact that the dancer was ill at the time of the performance. A little breathlessness towards the end of the item was due to the artiste's physical indisposition, and not due to any lack of stamina or preparedness. The item was choreographed by Guru Aruna Mohanty and the music was by Sumanta Mohanty. 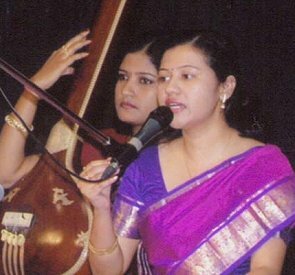 The next item was a duet performed by Sonali and Sasmita -"Jaya Bhagabati Devi Namo Barade" in Raga Gurjari Todi. It was a good and well coordinated performance which fell just short of being an excellent one. There needs to be a little tightening up of the outer lines of the body especially in the outer movements of the arms and legs. The dance choreography was by Guru Naba Mishra and the music was composed by Pt. Raghunath Panigrahi. The next item consisted of two pieces, a "Pallavi" in Raga Bajrakanti and an Oriya abhinaya "Kielo Sajani" in Raga Khamaj and was performed by Jyoti Srivastav. A good performance which showed the experience and maturity of this senior dancer. I would have been happier if the "Pallavi" could have contained more variety and complexity. The abhinaya piece however, was expressive and pleasing. Choreography was by Guru Duga Charan Ranbir and the music was by Sukanta Kumar Kundu. The concluding item of the evening was by Guru Somnath Pradhan and students of Ginwa and consisted of two pieces "Batu" and "Ambe." It was a disappointing performance all round. Guru Somnath Pradhan seemed to be quite unsure and looked visibly uncomfortable, showing unpreparedness for a stage performance at this level. Added to this, the Ginwa group gave a weak and disjointed display - the coordination was bad and the performance dull. Certainly not a National Festival level performance. Both the pieces were choreographed by Guru Somnath Pradhan. The first was set to music by Himanshu Sekhar Swain and the second by Guru Bijay Kumar Jena. The morning session of the final day, 30th December 2009, was inaugurated by acclaimed ‘Pala' singer Soubhagya Chhotray, and Sanskrit slokas were recited by his grandson Surya Narayan Chhotray. 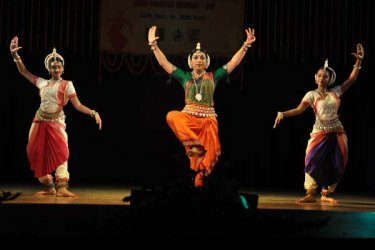 The opening item was set of two pieces - "Sakhigo mora kunjaku" in Ragamalika and "Leela nidhi he" in a traditional tune, danced by Nandita Tripathy. It was a pedestrian performance and it was obvious that this dancer needs far more training and polish to come up to a festival level performance. The first piece was choreographed by Guru Gangadhar Pradhan and music was set by Guru Ramahari Das while the second piece was also choreographed by Guru Gangadhar Pradhan to a traditional tune. The next item was by Rajashri Biswas who performed a "Pallavi" in Raga Hamsadhwani. It was a good performance and the control she had over her dancing spoke well of her training and preparation. The item was choreographed by Guru Kelucharan Mohapatra and music was composed by Pt. Bhubaneswar Mishra. This was followed by the classic Guru Kelucharan Mohapatra item "Nachanti Range Srihari" in Raga Arabi. 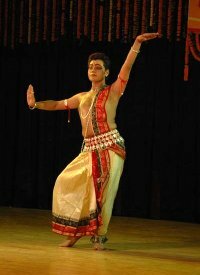 It was an inept performance by the male dancer Jyoti Ranjan Das who made glaring mistakes by not being able to give a faithful and true rendition of this often performed item. The music for this piece was composed by Pt. Bhubaneswar Mishra. 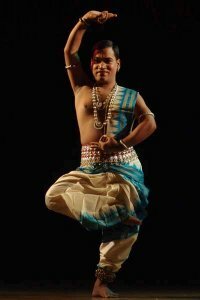 The dancer for the next performance Swayanpragyan Sahoo was absent. 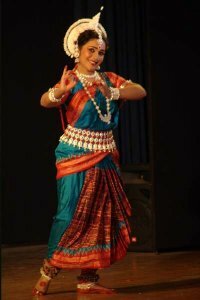 The next dancer Snehanjali Behera performed two items - "Pallavi" in Raga Bihag and "Mali Mala Shyamaku Debi" in Raga Khamaj. It was a good performance though occasionally it seemed there was a drop in stamina. Her performance indicated that she has the potential to become a good dancer. Both the items were choreographed by Guru Kelucharan Mohapatra and while both the items were set to music by Pt. Bhubaneswar Mishra, the music for the second item was an adaptation based on a traditional tune. 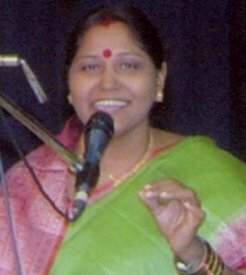 The following item was by Sonali Acharjee who performed to a traditional Oriya song "Mu biki deichhi parana Ghanashyamaku." It was an above average performance. The choreography was by Muktilata Pal and music was composed by Binod Bihari Panda. The next item was a "Pallavi" in Raga Shankaravarana, another classic choreography by Guru Kelucharan Mohapatra with music composed by Pt. Bhubaneswar Mishra. It was a satisfactory performance and the dancer Sangeeta Chhotray certainly has the potential to grow. However considering that this classic piece has been often performed, the nuances that should have been expressed were not visible. The concluding item of the morning session was "Krishna Leela" which was performed to recorded music. This group item was led by Jyotsna Sahoo in the role of Lord Krishna, and she herself was the choreographer of the piece. While the item was presented well and the dancing was neatly executed, one could not escape the feeling that Jyotsna could not bring out an essential aspect of Krishna's character - the spark of naughtiness and mischief that makes Lord Krishna such an endearing character on stage. While the music, composed by Swapneswar Chakraborty, was definitely good, there were a few phrases where light music has crept in. But since the overall presentation in both dance and music was of good quality, the little oddity in music was hardly noticeable. The opening item of the evening session (30th December 2009) was easily the highlight of the entire evening. Named "Badya Bichitra," it was an attempt to orchestrate a variety of instruments to play Odissi tunes, and it was very successful and pleasing effort. All the musicians performed with total understanding of each other and the effect was a combination of high skill, experience and musical sense which succeeded in bringing out the typical character of Odissi music. The instrumentalists were Guru Satchidananda Das on Khanjani and Mardala, Kalandi Charan Parida on Khol, Nilachal Patra and Agnimitra Behera on Violin, Aviram Nanda and Jabahar Mishra on Flute, Swapneswar Chakraborty on Sitar, Ajay Kumar Satapathy on Harmonium and Bibekananda Panda on Manjira. The tunes were "Sajani ki laje sarili" in Raga Bageshri and "Mana Sumana" in Raga Mishra Khamaj. The following item was a set of two songs sung by Ranjita Senapati. The first was "Kana tu deri tha banshi tanaku go Radhe" in Raga Bajrakanti and the second was "Ehi sehi paralo sajani" in Raga Kirwani. It was a satisfactory performance but never reached any great heights. The following item was a set of two songs sung very well by Rupak Kumar Parida. It was a very pleasing performance of Odissi singing and it is obvious that the singer has excellent potential. One suggestion however needs to be made. When the singer descended to the lower register, there was, on occasion, slightly diminished tunefulness. A complete artiste needs to sing in perfect key in all registers. Rupak rendered "Sajani ki laje sarili" in Raga Bageshri and "Cha" Champu in traditional tune. 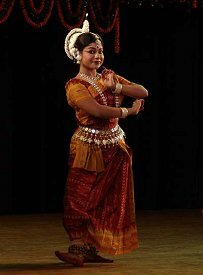 The first item of the dance section was a performance titled "Suryastaka" and was danced by Smrutirekha Tripathy. It was good, well-rounded performance and gave a strong impression of the future potential of this young dancer. The piece was choreographed by Guru Durga Charan Ranbir and music composed by Guru Ramahari Das. The subsequent item was performed by Subikash Mukherjee, who rendered "Ardhanarishwra" in Ragamalika and Talamalika. His handsome face and physique contributed to a pleasing stage presence. It was a good performance of "Ardhanarishwara" and his natural abilities combined with physical attributes give promise of a bright future. However, good preparation for one or two performances may carry the day, but long and diligent practice is unavoidable if the dancer wants to grow into a fine artiste. The item was choreographed by Guru Kelucharan Mohapatra and the music was composed by Pt. Raghunath Panigrahi. The following item was a "Pallavi" in Raga Bilahari performed by Bijan Kumar Palai. It was a good performance giving clear indications of excellent potential. The stamina and staying power of this young dancer was evident and signifies a bright future as a dancer. However, since his physique is not developed and he is on the thin side, he looked very lanky; his stage presence needed to be augmented by better make-up. While the choreography was by Guru Kelucharan Mohapatra, the music was composed by Pt. Bhubaneswar Mishra. The next item was a duet performed by Subhashree and Pragyanseni. It was a composition titled "Juge Juge Jagannath." It was a run-of-the-mill performance and there was hardly any outstanding feature of the dancing that merited a National Festival slot, that too on a closing day. The dancers need much more training and preparation. The piece was choreographed by Guru Niranjan Rout and Puspita Mishra: the music was composed by Ramarao Patra, Sukanta Kumar Kundu and Guru Dhaneswar Swain. 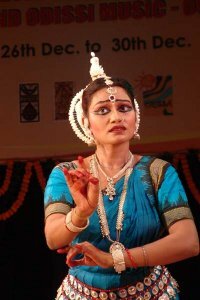 The following item was a very important one considering that it was a performance by the veteran Odissi danseuse Dr. Minati Mishra. The large audience was waiting for this performance with great anticipation; it must be said that their expectations were completely fulfilled by a very balanced, mature and graceful performance by Dr. Minati Mishra. Her advancing years seemed to have had no effect on her skill, poise and stage presence. 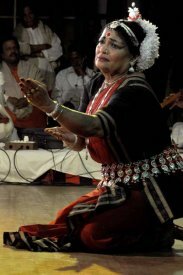 The Mardala accompaniment by another Odissi veteran Guru Banamali Maharana was also of an exalted quality, and together with Guru Ramahari Das's singing, was altogether an inspired performance. However, the Manjira accompaniment by Guru Gobinda Pal on occasion was out of sync with the Mardala playing and was unexpected of an artiste of such seniority. Dr. Mishra performed "Jagannathashtak" and an ashtapadi from Gita Gobinda "Nindati Chandana" which were choreographed by Guru Kelucharan Mohapatra and Guru Debaprasad Das respectively and the music for both the pieces were composed by Guru Balakrushna Das. The concluding item of the National Festival was three dance pieces by Daksha Mashruwala and group. Considering the high class of the previous performance of Dr. Minati Mishra, this item should have suffered by comparison. That it did not because this was also a well executed performance in both solo and group presentations. There was good coordination among the dancers and Daksha Mashruwala, herself a senior artiste, led by example with expertise born of long experience and practice. The first piece was a "Pallavi" in Raga Khamaj and danced by the group; it was choreographed by Guru Kelucharan Mohapatra, with music by Pt. Bhubaneswar Mishra. 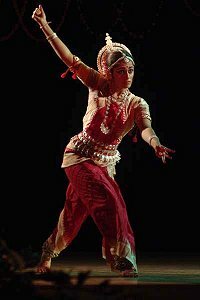 The second was a solo piece of an Ashtapadi from Gita Gobinda ("Kishalaya shayana taley") in Raga Bibhas, choreographed by Guru Kelucharan Mohapatra and with music by Pt. Raghunath Panigrahi. The last piece was a group dance named "Ragamala" and set to a Ragamalika composition in which every Raga represented a particular goddess; choreographed by Daksha Mashruwala, it was a skillful composition with imaginative music composition by Manoj Desai and Vijay Tambe. 1. I found the "compeering" in the evening sessions too long and repetitive, thereby becoming monotonous. Also, the habit of generously doling out adjectives and accolades in equal measure to young dancers as well as established artistes, is patently unfair. The younger artistes need more time and experience to deserve such free flowing and overwhelming praise. In contrast, the compeering for the morning sessions was adequate and to the point. 2. The other avoidable habit is the practice of serving tea and snacks to dignitaries and others while the performance on stage is in progress. From the view point of our culture which respects Art almost as a form of divine expression, it is very insulting for an artiste on stage to see the performance being disturbed by the distribution of tea, snacks and irrelevant conversation. It is incumbent on the part of the Art establishment to stop such practices so that their example will be followed by those in the private sector who organize performances and festivals. 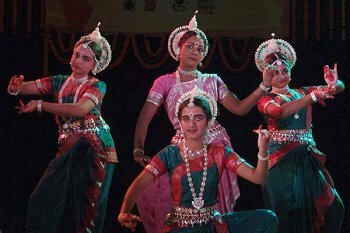 The National Festival of Odissi Dance and Music is an event of considerable importance in the cultural life of Orissa. While extending my congratulations to Guru Kelucharan Mohapatra Odissi Research Centre, I also wish to commend the supportive efforts of Dept. of Culture & Tourism, Orissa and Sangeet Natak Akademi, New Delhi. I would like to record my thanks to the organizers for providing me an opportunity to witness the festival as an observer, and it is my belief that my objective comments will be taken as coming from a genuine well-wisher of the Festival who hopes to see it growing from strength to strength in the years to come. Guru Ratikant Mohapatra is the Director of Srjan (Guru Kelucharan Mohapatra Odissi Nrityabasa) in Bhubaneswar.